Info "Light the cannon's fuse! Don't touch the water, though. It'll put your fire out!" You're Fired! is one of Ashley's Microgames in WarioWare: Smooth Moves. The name is a pun on "you're fired", a common phrase used when terminating employees from a workplace. 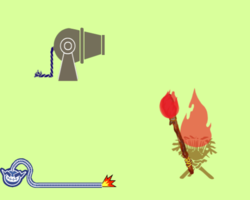 The player has to control a stick to light it with the torch and then bring it to the cannon to fire it. If it comes into contact with water it will die out. 1st level difficulty: There is only one cannon. 2nd level difficulty: There is a water sprout and one cannon. 3rd level difficulty: There is a water sprout and two cannons. This page was last edited on February 24, 2018, at 23:58.